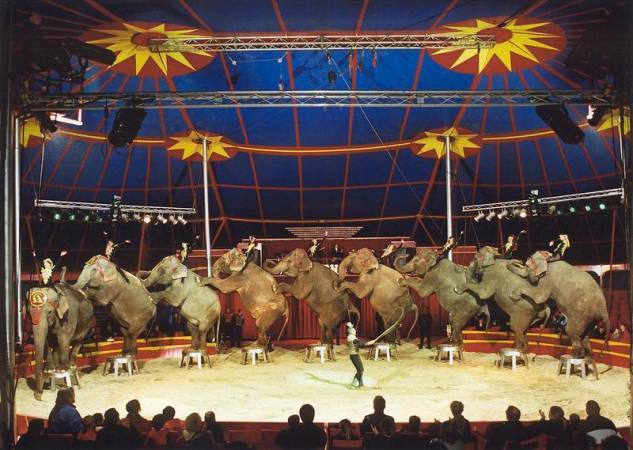 Kim Benneweis with elephants from Circus Americano (Flavio Togni) at Circus Arena, 2001. Kim Benneweis was born 1956-12-06, son to Sonny Benneweis (1933-1979) and Nelly Jane (born 1934), and grew up at Circus Benneweis in Denmark. During tour 1994 in Nyborg, Denmark, the elephant Siam attacked Kim Benneweis, and almost killed him in the ring. Kim Benneweis left Benneweis circus in 1995, and was from 1997 to 2001 superintendent at Circus Arena in addition to being in charge of the nine elephants. From 2001 General Superintendent at Circus Scott, Sweden, and later horse trainer at Team L.A. in Denmark.